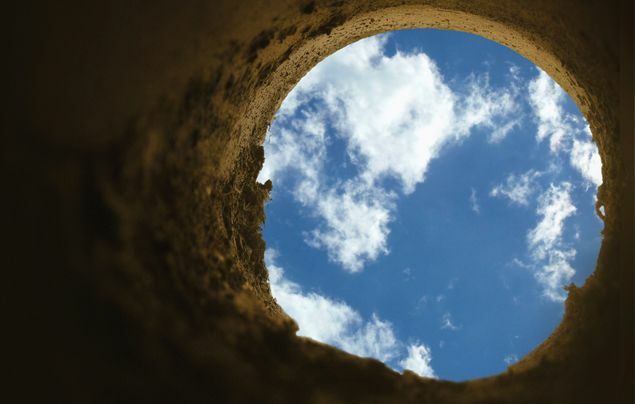 Have you ever thought of digging a hole in your backyard deep enough to take you to the other side of the world? Suppose you really could drill a hole right though the centre of the Earth. What would happen if you jumped in? It’s going to be tricky drilling through about 12,750km of solid rock, molten lava, liquid iron and solid iron! Let’s just pretend for a moment… We would have to make the tunnel out of some special material (that doesn’t exist yet, but that could withstand the incredible pressure and temperature at the centre of the Earth). To make it easier, we jump straight from the North to the South Pole (so the spinning of the Earth doesn’t scrape you against the wall of the tunnel). At the moment you jump in, the entire mass of the Earth is ahead of you – pulling you with its gravity. By the time you reach the dead centre, you are moving at about 28,000 km/h! If you could magically stop in the middle, you would just float. The weight of the Earth ahead of you would be exactly balanced by the weight of the Earth behind you. But it’s not easy to stop, because you’re travelling at such a great speed! After you cross the midpoint, you begin to slow down. About 38 minutes after entering the tunnel, you pop out of the other side of the Earth. Now you either pull yourself out of the tunnel, or just let yourself drop back and forth forever – until you get sick of it!